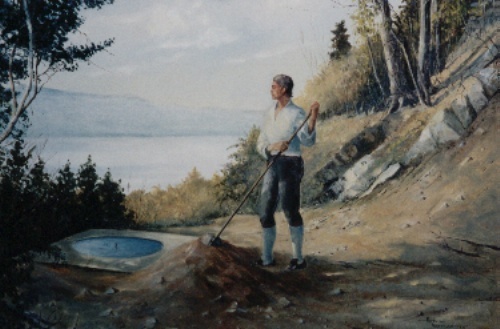 While serving as Fortifications Engineer for West Point, Kosciuszko selected a site for his Garden. 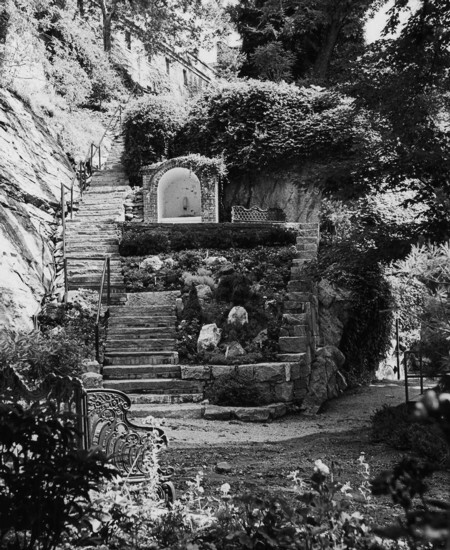 And, since he had chosen it to be a personal place of serenity and contemplation, he never asked or ordered soldiers, civilian laborers, or prisoners of war to help him clear away the wild vegetation or to channel the mountain stream, or to carry soil down to the rock-bound Garden from the Plain overlooking it by way of a precipitous footpath so that he could transplant wild flowers and other foliage conducive to ornamental cultivation in vogue for those times. Throughout the 19th century, the Hudson River Valley and West Point became major tourist attractions for many Americans living in the downstate New York - northern New Jersey area. These attractions were fueled by the success of the "Hudson River School" of American Painters, on the one hand, and the other being the popular book, Tales from the Garden of Kosciuszko by Samuel L. Knapp, published in 1834 by West and Trow. 1778: Here I had the pleasure of being introduced to Colonel Thaddeus Kosciuszko, a gentleman of distinction from Poland... He had amused himself while stationed at the Point, in laying out a curious Garden in a deep valley, aboudning more in rocks than in soil. I was gratified in viewing his curious water fountain with spraying jets and cascades. --Entry made in the Journal of July 28, 1778 by Dr. Thatcher. Source, USMA Archives. --From the Memoirs of General Gardner Swift. General Swift had been the first graduate of the United States Military Academy. Source, USMA Archives. 1817: The following day, the party at West Point, and Mr. Monroe, met the officials in the Garden of Kosciuszko, and there he related the following story of that Pole: When Kosciuszko came from Europe wounded, he seemed unable to move when applying to Congress, and received a grant of land. It was said lameness was assumed to excite sympathy among cold-blooded members. Mr. Monroe said it was not, but to impress a Russian spy that he was not longer able to wield a sword, who was so impressed; and Kosciuszko resumed his health lost in a Russian prison. Mr. Monroe said Kosciuszko had been a faithful friend of the American cause, and that he had recently remitted him several hundred dollars to sustain him in his retreat in Switzerland. This sojourn at West Point and the examination of the Cadets, was very refreshing after city fatigues. --From the same Memoirs of General Gardner Swift. Reference to the June "Tour of President Monroe in the Northern United States, in the Year 1817." Source, USMA Archives. 1834: After a fatiguing walk to Fort Putnam, a ruin examined by every visitor to West Point, I sought the retreat called Kosciuszko's Garden. I had seen it in former years, when it was nearly inaccessible to all but clambering youths. It was now a different sort of place. It had been touched by the hand of taste, and afforded a pleasant nook for reading and contemplation. The Garden is about thirty feet in length, and in width, in its utmost extent, not more than twenty feet, and in some parts much less. Near the center of the Garden there is a beautiful basin, near whose bottom, through a small perforation, flows upward a spring of sweet water, which is carried off by overflowing on the east side of the basin toward the River, the surface of which is some eighty feet below the Garden. 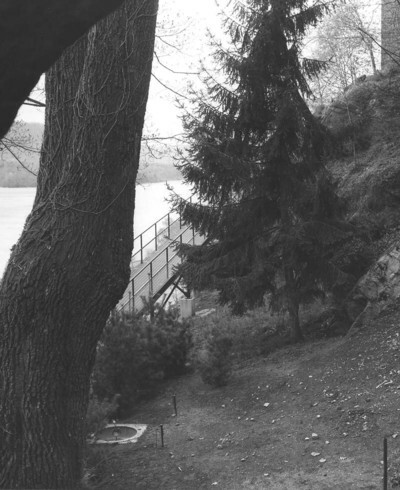 It was here, when in its rude state, the Polish soldier and patriot sat in deep contemplation on the loves of his youth, and the ills his country had to suffer. It would be a grateful sight to him if he could visit it now, and find that a band of youthful soldiers had, as it were, consecrated the whole military grounds to his fame. --From the Diary of Samuel L. Knapp of New York. Source, USMA Archives. 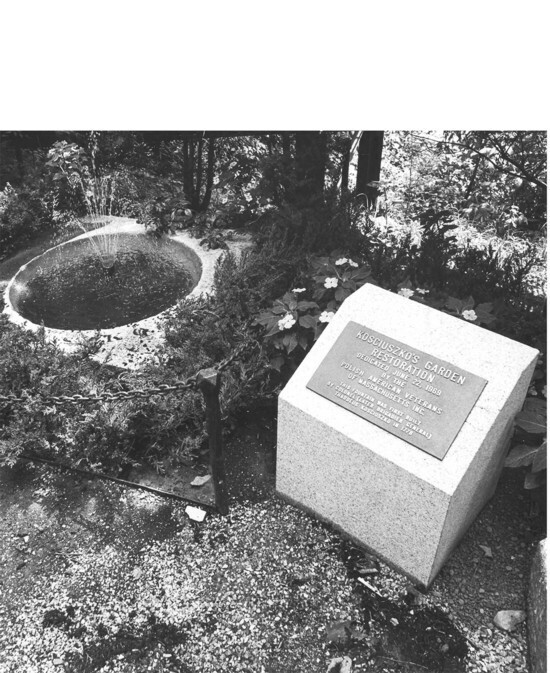 1967: The Polish American Veterans of Massachusetts officially began their Kosciuszko's Garden Restoration and Perpetual Care Project on Sunday, November 26, 1967 at Fall River, Massachusetts. Commander Michael V. Rostkowski appointed the following initial Committee to spearhead the fundraising in the state: Chairman, Commander Michael V. Rostkowski; all past State Commanders of the PAV; all Post Commanders of the PAV; all members of the Executive Committee; Joseph Alecks, Commissioner of Real Property; Thaddeus Buczko, State Auditor; Joseph J. Jakubowski, Webster, MA (Coordinator); Henry Archacki, New York State; General Charles G. Stevenson, National Chairman. According to the proposal drafted by General Stevenson, and accepted by the state convention, about $ 2,000 will be required for purchase and installation of initial plantings, rock formations, fountain fittings, benches, and to landscape the area and its approaches. Remaining funds required, about $ 10,000 will be used to establish a maintenance endowment fund. --Excerpts from front page article, "Kosciuszko Garden Committee Formed," printed in the December 14, 1967 issue of the Polish American newspaper, Gazeta Polonii, in Boston, Massachusetts. 1969: I am honored to extend my best wishes and heartfelt thanks to the Polish American Veterans of Massachusetts and their many friends who have made this dedication possible today. It is most fitting that this restoration be accomplished on the very spot that General Kosciuszko so dearly loved, amidst the many standing tributes to his greatness as an Engineer. --Message of General W. C. Westmoreland, Chief of Staff, United States Army, sent to the Dedication of the Restored Kosciuszko's Garden, West Point, NY, 22 June 1969, for Release, 23 June, 1969. Courtesy, USMA Archives. 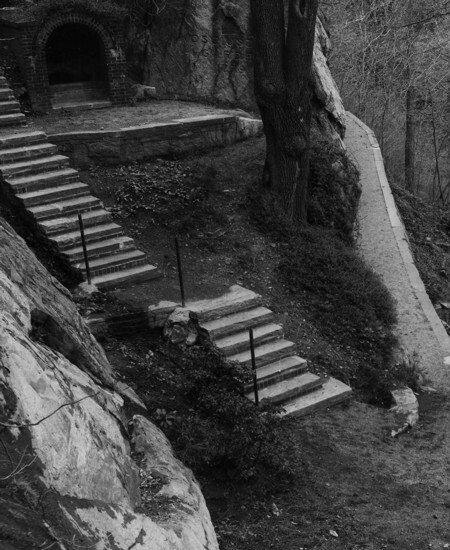 Kosciuszko's Garden in stages of restoration. 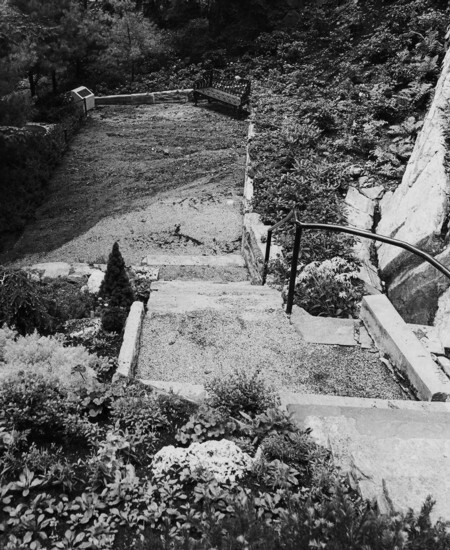 Kosciuszko's Garden as it appeared prior to the Restoration and Perpectual Care Project of the Polish American Veterans of Massachusetts, Inc.
Kosciuszko's Garden as it appeared fully restored on June 22, 1969. 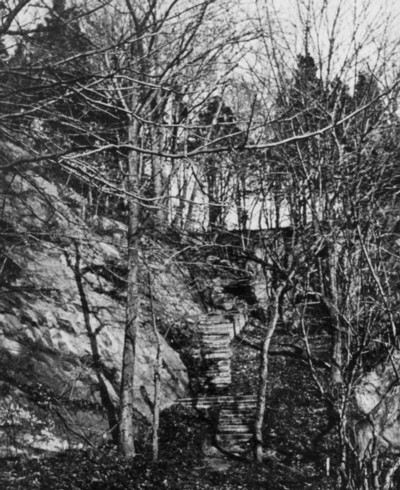 United States Army restoration project photographs: Courtesy, Public Affairs Office, United States Military Academy, West Point, New York. 2003: Following the Annual National Tadeusz Kosciuszko Observance at the United States Military Academy in West Point, New York on May 3, 2003, the Academy hosted a special commemorative ceremony in Kosciuszko's Garden to announce the creation of the "General Edward L. Rowny Family Endowment" that was established to further sustain perpetual care and maintenance of the Garden and to dedicate a plaque commemorating the occasion. After graduating from Johns Hopkins University, Class of 1937, General Rowny sought admission to the United States Military Academy where he went on to become a Class of 1941 USMA Alumnus. As a Cadet, he was a member of the "Kosciuszko Squadron" from 1937 to 1941. The Squadron consisted of American Cadets of Polish descent who met only twice a year. Their primary meeting was connected with the annual wreath-laying ceremonies at the Kosciuszko Monument. Their second meeting was a four-hour seminar on a Saturday afternoon in early December at which time a variety of subjects were covered, principally dealing with aspects of the legacy of Tadeusz Kosciuszko. --From the records of the American Association of the Friends of Kosciuszko at West Point.